Munich (München, in German) is one of those cities that, once visited, stays in the heart forever. Renowned for its architectural splendour and old-world charm, Munich is a city rich in history and royal splendour, with a touch of fantasy in its Italianate architecture and its zest for the good life. But the city's beauty is only one facet of its attraction. The home of BMW and Siemens, Munich is also an international business and manufacturing centre, a leader in automotive and electrical engineering and electronics; a media and publishing capital, as well as a major player in German television and film production. The city's financial strength has attracted insurance companies and banks from around the world, eager to do business in Germany. Munich was founded by Henry the Lion (official date: June 14th, 1158). First fortification of Munich is built. Munich passes from the rule of the bishops of Freising to that of the House of Wittelsbach. Munich becomes an imperial city (until 1347) and holds the imperial insigna during this period. Bavarian Academy of Sciences founded. Munich becomes the capital of the Bavarian kingdom. Bavaria becomes the first German state with a written constitution. The Bavarian parliament, the Landtag, sits in Munich, which is also the seat of the new archdiocese of Munich and Freising. Munich becomes a city of art of world acclaim. The architects Leo von Klenze and Friedrich von Gärtner build the Ludwigstraße, the Königsbau and the Festsaalbau of the Residenz, the Königsplatz and the Alte Pinakothek. Klenze builds the Ruhmeshalle - the hall of fame - on the Theresienwiese. Schwanthaler erects the "Bavaria" statue. The University of Landshut is moved to Munich. Development of the Maximilian Style in architecture. Music, arts and crafts flourish. Richard Wagner in Munich: world premieres of several of his music dramas. Peter Ostermayr establishes his film production company (movie production center Geiselgasteig). The Hellabrunn zoo is opened. Hitler had vowed five years prior to the Putsch that he would not "rest nor sleep until the November Criminals [the politicians who had signed the armistice] have been hurled to the ground, until on the ruins of the pitiful Germany of today has raised a Germany of power and greatness." This putsch was begun simply to avenge the armistice, the stab in the back. On 8th November Hitler broke into a meeting in a large beer hall, held by three leaders of the Bavarian government. Outside 600 storm troopers backed him up. He forced the three leaders to tell their audience that they would give the Nazis their full support by putting a gun to one of their heads. Then the German war hero, General Ludendorff made an appearance pledging his support of Hitler. While this took place Storm Troopers took control of government buildings and arrested officials. They were led by Ernst Röhm. On 9th November the three Bavarian leaders went back on their words and ordered the army to attack Röhm and his troops. Röhm needed help and Hitler, Ludendorff and 2000 Nazis went to help him*. The armed police shot at the Nazis as they made their way into Munich. 16 Nazis were shot dead, Hitler, however, got away with a dislocated soldier. He was caught later that day however**. Both Hitler and Ludendorff were arrested and the revolt collapsed. Hitler gained recognition not only for the Putsch but also for the trial that took place later. His 24-day trial reached the front page on a daily basis. He twisted the trial so even though he still went to prison, he drummed up much support. He made the November Criminals the traitors and made himself look like the "saviour" of the German people. He was such an orator that the way he spoke influenced the judges on their decisions. That is why Hitler was only given 5 years with the chance of parole after just six months. Ludendorff got off free and the rest of the Nazis that had participated were let off with equally gentle sentences. One could argue that if Hitler had not have been sent to jail then he would never have written Mein Kampf, the book that would become the bible of the Nazi movement. Perhaps the sentence he was given can be seen as a major benefactor in him taking power. If he had been given a tougher sentence he may not have rose again until Germany had become more stable and therefore less willing to change. The first television set in the world is exhibited at the Deutsche Museum. Munich is dubbed the "capital of the movement"
An attempted assassination of Hitler in the Bürgerkeller fails. Munich is occupied by the Americans (April 30th 1945). Munich has 1 million inhabitants by December 15th. The XXth Olympic Games in Munich. Soccer's World Cup in Munich. 100th anniversary of Ludwig II's death. 200th birthday of Ludwig I. 200th anniversary of the English Garden. 400th anniversary of Munich's Hofbrδuhaus (court brewery). Opening of the new "Franz-Josef Strauß" airport. 500th anniversary of the Cathedral Church of Our Lady, Munich's landmark. Munich's cosmopolitan flair, however, is flavoured by its small-town friendliness, and its many attractions are easily accessible through an impressively efficient public transportation system. Munich is also a city of culture with over 100 theatres and museums, four symphony orchestras, and three opera companies. It is a research and academic centre as well as a much-desired setting for international meetings and conventions. The gardens are situated on the west side of the city near to the Schloß Nymphenburg. Ask for the Tram from Main Station (Hauptbahnhof) which stops right outside. The park like design of the garden was created between 1909 to 1914. A restaurant is open most days for meals and light refreshments. A wide range of plants and trees cover a large area. A glasshouse has many varieties from around the world. Well worth seeing. A small entrance charge is made. There are two Botanical Gardens in Munich. The older garden is near to the Hauptbahnhof. The garden at Nymphenburg Schloss has more than 15,000 different plants. The Magnolia trees make a spectacular display in springtime. The largest collections of orchids in Germany are on display in the environmentally controlled hothouse. Munich`s most popular attraction is probably the world-renowned inn called "Hofbräuhaus".It is within walking distance from underground station "Marienplatz" If in doubt, ask any person you meet on your way, it is well known! To pay a visit to the Hofbraeuhaus is probably top of the list of any Munich sightseeing tour. All day long, you will find tourists there singing "In Muenchen steht ein Hofbrauhaus eins, zwei g'suffa ...". Bavarian hospitality, at least when adapted to the needs of tourism, seems to contribute to international understanding when Japanese, Chinese, Albanian, Croatian, Turkish and Greek people keep on swaying peacefully. The atmosphere in the Hofbraeuhaus conveys a bit of Oktoberfest mood. If you are tough, when dare to take a deep breath! You will experience an incomparable mixture of different flavours, i.e. (stalled) beer, smoke, roast, that you are going to either hate or love. Nevertheless, the evidence for tasty Bavarian cuisine is convincing. However, genuine Bavarians avoid the place. In 1556 Duke Albrecht V brought Orlando di Lasso, the Pope's chapelmaster, to Munich and appointed him head of the court chapel. He is regarded as one of the most brilliant composers in Western musical history. His activities in Munich constitute one of the highlights in the so rich tradition of the Bavarian metropolis. Felix Mendelssohn-Bartholdy wrote from Munich in 1830: "Here there is an uncommon amount of sensitivity for music, and it is exercised in a variety of ways." Nor has this changed since then. In the legendary Odeon concert hall Clara Schuhmann and Anton Bruckner once experienced triumphant successes. Today many doors are open for the music-loving public. The best known include the Hercules Hall, the Max Joseph Hall and the Fountain Courtyard in the Residence. But the major concert hall is to be found at the Gasteig Arts Center, completed in 1985. It is looked upon as the most modern of its kind in Germany. The heart of this building is the Philarmonie with a seating capacity of 2500. In addition to the palaces, many churches also offer a festive setting for classical music. In the Olympia Hall there are performances by the stars of pop and rock. The Koenigsplatz, Olympic Stadium and West Park are available for numerous open-air events. The city's musical scene ranges from classical to jazz and from folk music to the shrill sounds of modern music. Young talent is discovered at many competitions and promoted, and hardly any of the famous fail to put in an appearance in the Bavarian capital. Under the spell of the classical statues in the Louvre in Paris and the Parthenon sculptures in London, King Ludwig I, while still crown prince, made up his mind to turn Munich into a "cultural work of such sheer perfection as only few Germans have experienced". He pursued this "Greek dream" during his regency. At the beginning of it, in 1825, he built the Glyptothek. And on the day of his abdication in 1848 he approved the plan to build the Propylaeen. The Koenigsplatz (King's Square) with its buildings was thus complete, and Munich became known as the "Isar Athens". The precious originals of the State Collection from the Ancient World can be admired behind the classical Grecian gabled faηade: in the Glyptothek, for example, the 2400-year-old pediment figures from the Temple of Aphaea on Aegina or the magnificent Barbarian Faun. In the building opposite with its high portico borne by Corinthian columns, precious vases and small sculptures, masterpieces of Attic art from the 6th and 5th centuries BC and unique Etruscan jewelry have found a worthy home. Most of the care-free young people who fill the square with life are from the nearby Technical University. Here, many famous scientists, from Justus von Liebig to Nobel laureate Rudolf Mφssbauer, have taught and carried out research. In the shadow of the Propyläen the painter prince and portraitist of many well-known contemporaries, Franz von Lenbach, had a villa build around 1890 in the Italian Renaissance style. Today it is the home of the Municipal Gallery. In the Koenigsplatz Underground Station the Lenbach Gallery runs an additional Art Hall, which is used for special exhibitions of a high standard. Behind the Lenbach House the State Paleontology Collection takes us back into earlier geological eras with skeletons of a 10-million-year-old primeval elephant, giant winged dinosaurs and other extinct creatures. The Brienner Strasse, as straight as a die, connects the Koenigsplatz with the Odeonsplatz close to the Residence. In the middle of it, at Karolinenplatz, the 30-meter-high obelisk, paneled with metal plates, recalls the 30000n Bavarian soldiers who lost their lives in Napoleon's Russia Campaign. Only a few yards away from the Kφnigsplatz is the St Boniface Abbey, which the admirer of Greece, Ludwig I, commissioned Ziebland, who lies buried in its basilica, to build in the middle of the 19th century. He was the last of the passionate, knowledgeable art collectors with good taste from the house of Wittelsbach and also the most important: King Ludwig I. When, in 1826, he had the Old Pinakothek built, he contributed to it the rich treasures of his ancestors as its initial holdings. Duke Willem IV had already commissioned a cycle of historical paintings, of which the Battle of Alexander at Issus by Albrecht Altdorfer became world-famous. Thanks to the Dόrer paintings belonging to Prince Elector Maximilian I, the rich Rubens collections from the acquisitions of Prince Elector Max Emanuel and the considerable number of pictures held by Johan von der Pfalz, the Old Pinakothek possessed treasures that made it one of the major collections in the world as soon as it was opened. Its gems include Leonardo da Vinci's The Virgin and Child, Titian's Christ Crowned with Thorns, Rembrandt's Passion Cycle, Michael Pacher's Altarpiece of the Church fathers, Breughel's Land of Cocaine and works by the Spanisch painters Velasques, El Greco and Murillo. The new Pinakothek, too, which was reopened in 1981 as a modern museum building, has its origin in Ludwig I's passion for collecting. The leading representatives of early romanticism, such as Caspar David Friedrich or the French avant-garde with Cιzanne, Manet, Corot and Courbet hang beside works by Goya, Gainsborough, Leibl and Spitzweg. 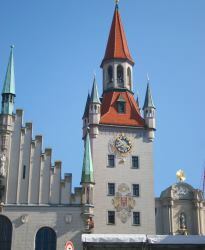 But Munich's worldwide reputation as a city of the fine arts is also underpinned by a number of other famous collections. The Gallery in the Lenbach House contains unique works by the Russian artist who chose to live in Munich, Wassily Kandinsky, as well as paintings by his friends in the Blauer Reiter (Blue Rider) group of Munich artists, such as Franz Marc and Gabriele Mόnter. In the Schack Gallery there are famous pictures by Schwind, Bφcklin and Lenbach. The State Gallery of Modern Art is devoted to contemporary art from the beginning of the 20th century. Its precious holdings will in future find a fitting home in the Pinakothek of Modern Art which is to be build in the immediate vicinity of the rest, and thus yet another highlight will be added that will further enhance Munich's reputation as an international city of art.